Please complete the details below if you wish to register to receive your rates and instalment notices via email. You will receive a verification email as part of the registration process. If you are not the owner or registered agent for the property you are not eligible to register. There can only be ONE email address for each notice. If there is more than one owner of the property and other owner/s apply to receive the electronic notice, the default will send the email to the email address of the last person who registered. The registration process will automatically close 21 days prior to the issue date of any rate or instalment notice. If the registration has not been received in time for when the next notice is issued, you will automatically receive your rate or instalment notice by post. Placing your cursor over the question mark will display helpful tips. For the purposes of these terms and conditions reference to a rate notice also includes reference to any rate final notice and instalment notice. If you authorise an Agent to act on your behalf you must notify us when this changes or is cancelled and you or the Agent must 'unsubscribe' from your eRates registration. To unsubscribe please click on the link at the bottom of the last email. 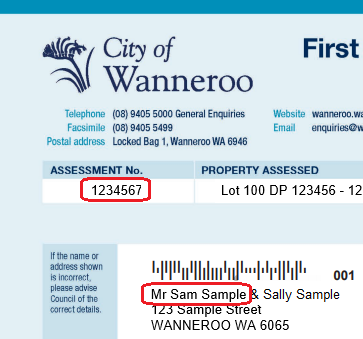 You must regularly check your nominated email address and junk mail folder for rates notices. If you change your eRates email address, you are required to re-register your new email address. Should the City receive an electronic 'delivery failure' notification from your email address the request for email delivery will be cancelled and a paper document will be posted to the last advised postal address. You can withdraw your request for email delivery of your rate notice at any time. To unsubscribe, please click on the link at the bottom of the last email. For general rates enquiries, please contact us by completing our online rates enquiry form. For more information about City services, programs, facilities and events visit our website, subscribe to an e-newsletter and follow us on Facebook, Twitter or YouTube. Other than your Rates notification, we'd like to able to send you information relating to other Council Services, Activities or Events by email, SMS, phone and other electronic means. Your personal details will be treated with utmost care and will never be disclosed to other companies for marketing purposes. Yes, I would like to receive other communications.